In this research, we will analyze the Covered Call for the SPDR S&P 500 ETF (SPY). It turns out all other major US equity indices demonstrate very similar results: Dow Jones Industrial Average (DIA), Russell 2000 (IWM), Nasdaq-100 (QQQ), and even equity index of the developed countries excluding US and Canada - MSCI EAFE (EFA). 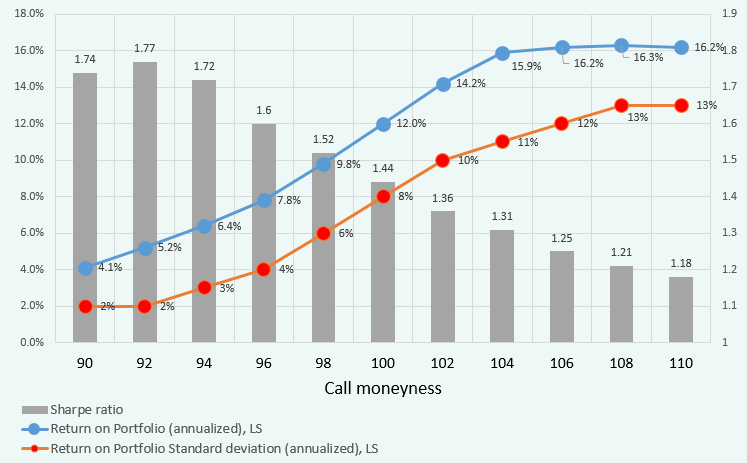 For our analysis, we have taken 4-week (20 trading days) SPY call options and calculate the Covered Call performance metrics for the recent bull market started in March 2009. At the time of this research writing (November 2017), it was still continuing. Two previous bull markets, Sep 93 - Apr 00 and Mar 03 - Nov 07, demonstrated the similar results; therefore, we will present all the findings just for the recent one. The reason of that is, obviously, the strong uptrend with the average underlying return of 1.38% per 4-week interval (17.35% annualized). If we remove this trend from the underlying data, the picture will be the opposite, see example in the post: Driftless Fair Value of options. Definitely, having the average return of SPY 17.35% annualized, this performance does not look appealing, especially in ITM zone. For the reason why the "overwriting" of the long equity positions with call options can impose a drag on the overall performance, see here. Pay attention to the ITM strikes. The standard deviation there resembles the short-term bond volatility (3-4% annually) while having substantially higher returns (6-8%). Relatively to the Buy&Hold, that equity curve looks like a straight line without meaningful fluctuations. That leads to the obvious temptation to increase the profitability by applying the leverage to this Covered Call strategy. 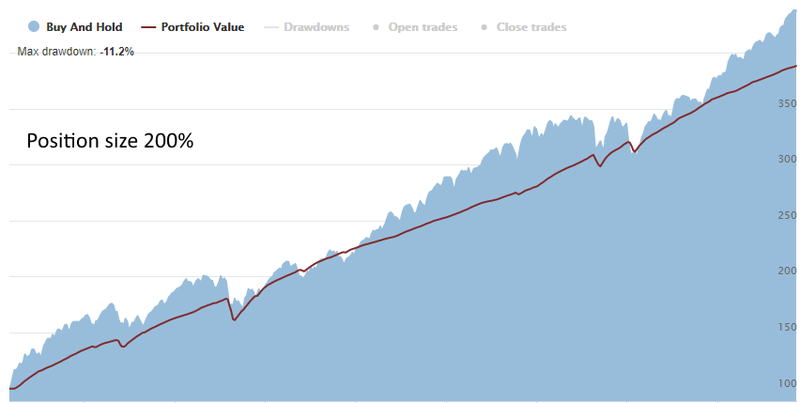 Leveraging the portfolio will increase both its profit and volatility with the same proportion. However, we have initially quite a good Sharpe ratio (1.6) that will remain the same even for the leveraged strategy. Annualized Return on Portfolio is 15.6% with standard deviation 8%. 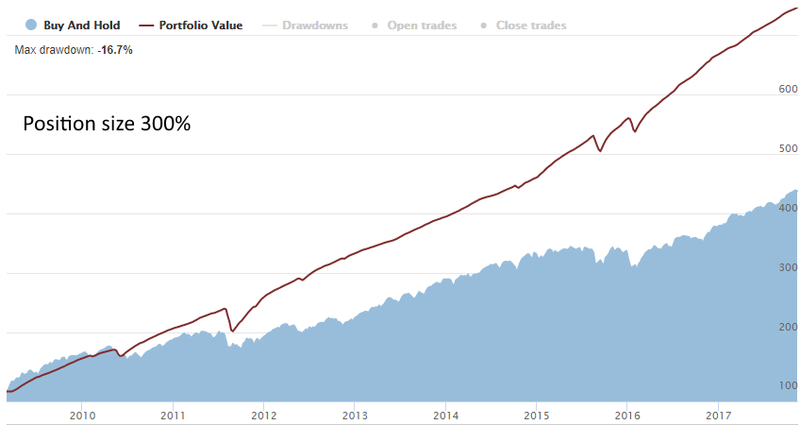 That Portfolio has an impressive 23.5% Annualized Return with a standard deviation of 12%, which is even slightly less than a Buy&Hold volatility of returns. 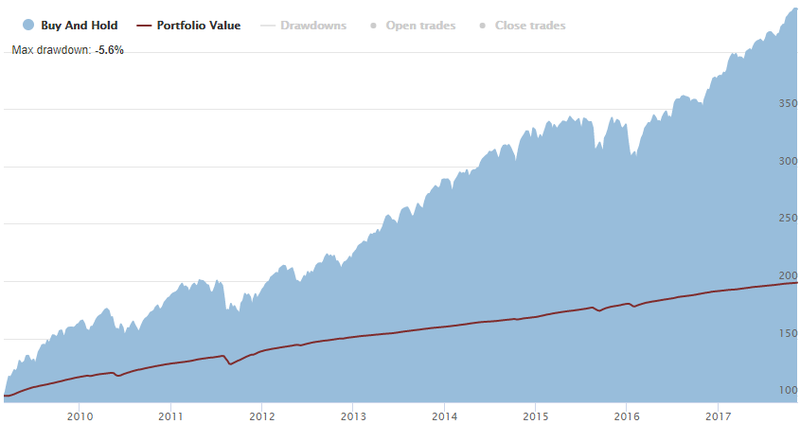 So, having a low volatility of returns, we can take a leverage to increase the absolute profitability while leaving the risk-adjusted metrics at the same, rather high, level. Another way to improve the performance is to play with a strike for the short call leg. 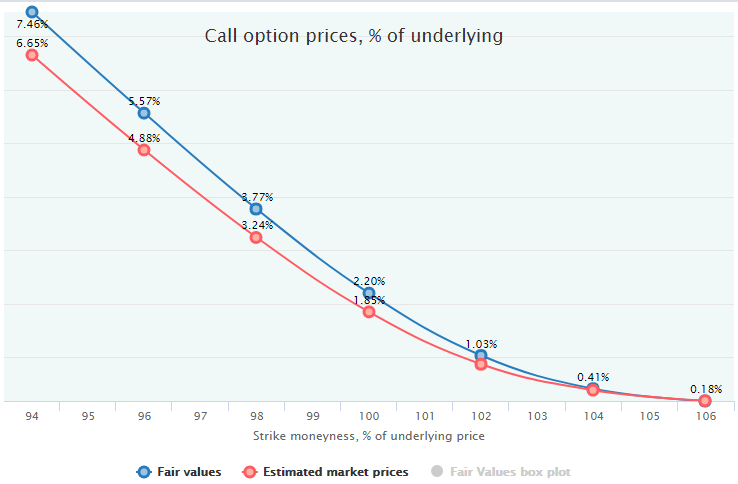 The most common way to construct a Covered Call is to sell out-of-the-money options to minimize the probability of ITM expiration and the call-outs of the underlying security. However, our analysis demonstrates (see above) that this choice is not optimal, and OTM short call legs add almost nothing to the whole performance: they do not add to the profitability and do not suppress the volatility. By moving from the center to the left, ITM side, we inevitably sacrifice some return; however, the respective standard deviation also drops and quite steeply. That lifts the Sharpe ratio, improves the risk-adjusted performance, and allow us to use leverage to enhance the absolute return metrics. So, the most optimal call strikes for the Covered Call strategy lie in the ITM area. The problem here is less liquidity and wider bid-ask spreads in the ITM area. In addition, it is necessary to handle the ITM expirations which are highly probable in this zone (90-94 moneyness of these 4-week options expires in-the-money with 98-94% probability). Despite all that, such a strategy can be quite attractive in terms of the risk-adjusted performance - even in the Bull Market environment when a short call strategy has negative expected profit.